Happy almost Friday friends! Sorry again for my absence yesterday! But I'm back from Jacksonville and all is good again! We had a nice little cold front come through this weekend and it was definitely a nice change of pace from the 80 degree weather we've been having but I have to admit, I was definitely jealous seeing everyone else's Snaps of snow they were getting, even if it was just flurries. But another cold snap meant it gave me an excuse to break out the cold weather gear again so I definitely won't complain. Lately I've been a huge fan of tops with either mockneck, turtleneck or cowl neck so when I saw this sweater I knew I had to have it. It didn't hurt it's currently on major sale and for someone trying to save a bit after spending probably way too much during the holidays, any little bit helps. A good turtleneck/mockneck sweater is a definite must have closet staple in my opinion. Back in my college days (when I was all about the cleavage) you wouldn't catch me dead in a turtleneck or mockneck but now that I've gotten older I understand and appreciate the conservativeness but I also realize that a turtleneck can be extremely flattering and looks great on just about everyone. I've also learned to appreciate warmer clothing on cold days ;) The joys of growing up! I kept things pretty casual here, pairing the sweater with some destroyed denim jeans and my favorite over the knee boots. The struggle is real for us short girls finding over the knee boots that aren't so far up your leg they look like you're wearing chaps! Please tell me I'm not the only shortie with this problem? Those boots are so perfect! They look great with those jeans too! Loving those sassy boot girl! I have a hard time finding turtlenecks that look right on me, but this one is so cute! i can't seem to stop buying turtleneck sweaters or mock sweaters either! There are just so many cute ones out there. Love the color of this one!! LOVE!! Those boots are amazing and that color looks great on you! :-) Since you prefer cooler weather, can we trade weather? Maybe send over some of that nice warm FL weather here? ;-) Haha. Have a great day girl!! Love this outfit! Esp the boots! PS--had no idea you were short! I thought you were model-tall! Love the colors too. So funny because as a tall girl I have the exact opposite problem! The only OTK boots I have ever owned are my Stuart Weitzman Lowlands! I have purchased and returned probably 30 different pairs over the years but none have ever been long enough. They all break mid-knee. 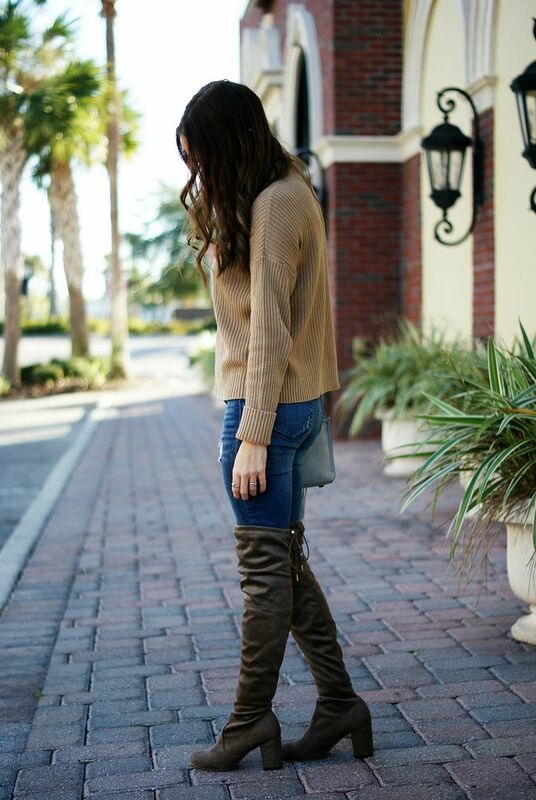 Those boots are gorgeous and I love a good mock neck! Such a cute look on you! Can't go wrong with a classic sweater like this. Totally loving this combo, lady- that sweater is so cool and the boots are to die for! I'm right there with you with loving a good turtleneck or mock neck top! They can be so perfect for the cold weather! I love how you styled this one with your beautiful over the knee boots! I had to laugh at your comment about the boots looking like chaps! Too funny! I love this style top! I feel like a nice turtleneck/mockneck sweater are ones that never really go out of style! I love a good mock turtleneck and this one looks so cozy! Love it paired with the boots! This sweater looks so comfy and warm!! I love it!! I love it with the boots, too! Flawless look!! I really love the sweater! LOVING this warm look, Pam! You look gorgeous! Hope you have a great weekend, beautiful! This look is perfection. I'm LOVING your boots!! Love the sweater, especially the color of it and your boots, I just love!!! Love those boots. Super warm and comfy outfit!